Sathie is a member of the board of directors and audit committees of a number of organisations including the Auditor General of South Africa, the Department of Home Affairs, ICASA, the Institute of Directors of South Africa, the Companies Tribunal and SARS. Sathie was a former Chief Executive Officer of Gobodo Incorporated. He has a vast range of experience in accounting, auditing, business advisory and operational efficiencies, consulting, corporate governance, due diligence, forensic investigations, investment advisory, taxation, turn-around strategies and valuations. Sathie initially established the accounting practice of S.Gounden & Company prior to merging into Gobodo Incorporated. He completed his audit training at Kessel Feinstein (now Grant Thornton). Sathie was a past President of ABASA (The Association for the Advancement of Black Accountants of Southern Africa), a Board member of the South African Institute of Chartered Accountants and a charter member of the BBC (Black Business Council). 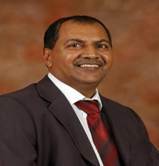 Currently, he is a stalwart of BBC and a national board member of ABASA. Sathie has a B.Compt from UNISA, a Diploma in Accounting from the University of Durban-Westville (now University of KwaZulu-Natal), a Certificate in Forensic Accounting from the University of Pretoria, is a Chartered Accountant of South Africa, Registered Auditor, Professional Accountant and Chartered Secretary.